Today, for the first time, a feature film is being released on USB. Ron Mann’s “Know Your Mushrooms,” a doc investigating the near-secret world of fungi that premiered at SXSW earlier this year, is being released on a 4-gigabyte re-usable USB flash drive. What’s more, the USB key comes in the form of a little fungi, and is included in a “hand-crafted” wooden box with an actual Alaska morel mushroom, hand picked by the film’s star, “fungi-master” Larry Evans. Mann – a celebrated documentarian known for films like 1982’s “Poetry In Motion,” 1992’s “Twist” and 2000’s “Grass” – talked to indieWIRE about his decision to take a different route with “Mushrooms” home-viewing release. 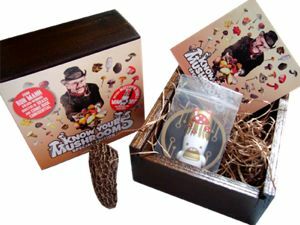 The “Know Your Mushrooms” box set. “Mushroom”‘s collector’s box is on sale today, and is available online at filmswelike.com, in specialty stores, and on Amazon through Warner Music Canada. As Mann, noted, it’s almost sold out, though it will have a “traditional” DVD release on September 15th.